Complex gunsmithing jobs require a lot of specialized tooling, and some common shop tools as well. In this post, I’ll walk through the tools and supplies I used during the rebarelling of my Winchester Model 70. There are a lot of options when it comes to tooling setups, and that will be a focus of this blog over time: comparing and contrasting different tools, setups, and techniques. So while your tooling setup will likely differ from what I talk about in this article, you should have a good idea of what you’ll need when you are finished reading! Let’s walk through this “station by station”. Barrel blank or barrel to re-chamber: You’ll need a barrel of the appropriate caliber (bore diameter), length, contour, material, and grade (standard -vs- match) based on your project requirements. Chambering Reamer(s): You’ll need at minimum a quality finisher reamer in order to chamber your barrel. You can optionally use a rougher reamer to remove the bulk of the material from the chamber prior to using a finisher reamer. You’ll also need to decide between solid pilot reamers and a bushing pilot reamers. Headspace Gauge(s): At minimum you’ll need a go-gauge for the chambering you’re working with. A no-go gauge is also required, but can be “improvised” with a go-gauge if you apply scotch tape to the back side (thickness needs to be ~.002″). Ranging Rod or Grizzly Bar: Depending on how you’re “dialing in” the barrel- you’ll need a bar and one or more bushings. The tools you use to take measurements while gunsmithing are absolutely critical if you want to obtain great results. That doesn’t mean you need to spend a ton of money on these tools- there are many bargains to be found at estate sales, ebay, and Craigslist on older quality tools. I use a mix of American made, imported, new, and used tools for these tasks. Lyman Borecam V2 Digital Borescope – This has proven to be an invaluable tool for inspecting bores and chambers. Was this barrel shot out? YES. Any chatter in the chamber? NO. Awesome. Brown and Sharpe Depth Micrometer (ebay) – A depth micrometer is critical for measuring tenon length, and chamber depth during the rebarelling process. This unit has worked great and was inexpensive. I’m looking forward to trying a digital depth micrometer! Mitutoyo .001″ Digital Micrometer (ebay) – I’ve had this Micrometer for 10 years and love how quickly it adjusts to different measurements, and the easy-to-read digits. These digital counter micrometers are really “analog digital” (how strange sounding) since they have a non-electronic digital display. iGaging EZ-Data Micrometer 0-1″ – For measuring turned diameters (Ex: tenon before threading) while machining, and making corresponding DRO adjustments. This is a great inexpensive digital micrometer with .00005″ (half-tenth) resolution, and one-touch calibration (I calibrate each time I use due to temperature and the extreme sensitivity of measurements taken). iGaging EZ-Data Micrometer 1-2″ – Same as 0-1″, but I use this micrometer to measure turning diameters greater than 1″ in diameter (Ex: barrel blank and turned tenon after initial pass). iGaging Origincal 0-6″ Digital Caliper – (see my post on this tool HERE) Perhaps the most versatile measurement tool in the machine shop. I used these for rough depth measurements, measuring outside and inside diameters, and rough thread depth measurements while threading the tenon and muzzle. Feeler Gauge Set (generic) – You probably already have these laying around if you work on cars. I use these to check cutting tool height on the lathe: when on center, the feeler gauge will rest perfectly vertical when held between the work and the cutting edge with slight pressure. I also used these gauges to measure chamber depth by measuring the gap between the action and shoulder when the action was spun on the barrel (with bolt and headspace gauge installed, bolt handle down). Now on to the “machining center”! 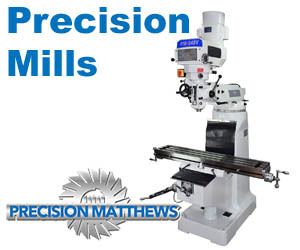 The metal lathe is the one essential piece of machine shop equipment for barrel work. It’s critical that you have the right machine setup with the right tooling if you’re exacting about your work. DRO: A 2-axis DRO with high-resolution cross slide scale is a huge benefit when working on rifle barrels! You can quickly estimate your tenon length cut, keep track of current turned diameter, and much more! I used the “Gordy Gritters Method” for this which involves the ~3-4″ of bore towards the end you are working on. Using a Grizzly Rod, precisely fit bushings, and an indicator you make 4-jaw and outboard spider adjustments until there is virtually no indicator movement along the section of bore you are working on. I’ll have much more content related to this lathe, and various rifle chambering setups posted here, so make sure you’re subscribed! This setup worked great, but I do have in mind to make a more substantial stop for the indicator- It’s not really necessary, so it may take a few years for me to get around to it. Like my collection, your inventory of tools, machinery, parts, and and supplies will grow and evolve over time. I like to start simple, and get more “elegant” as time moves on. For example, some day I would like to have a pressure flush system for cutting oil while chambering. For now, the “manual method” of clearing chips and applying cutting oil works fine. Great informative write ups which take the “voodoo BS” away from rifle re-barrelling.